The new TSC CPX4 digital color label printer series provides ultimate flexibility for businesses that demand high-quality label printouts on a regular basis. With the TSC CPX4 label printers, pre-printed labels are a thing of the past. Design your own labels and produce even small series of labels on demand and at low cost. Depending on requirements, there is a pigment-based version (CPX4P) and a dye-based version (CPX4D) available. The high print resolution and brilliant color rendition allow superb label printing for office, retail, hospitality and event, healthcare, logistics etc. applications. Due to the line printhead, the TSC CPX4 series printers reach high print speeds and allow quick and uncomplicated label printing. There is no need to buy and stock various pre-printed media rolls as it is possible to create customized layouts and print on demand. This ensures optimal flexibility and keeps waste to a minimum. There is a wide range of media options for different applications available, for example, roll-fed or fanfold media, die cut, gap, black mark, continuous media, matte or glossy paper, PET film or synthetic media. Create eye-catching labels, tickets, badges etc. with a distinctive look and a high recognition factor! The full-color label printers of the CPX4 series by TSC excel with exceptionally brilliant colors and sharp contours for premium printouts of barcodes, images and text. If small labels are required, the CPX4 series printers are suitable for labels as small as 25.4 mm x 6 mm. TSC’s Color Management Program ensures optimized color rendition. With the CPX4 series printers it is also possible to print GHS-compliant labels. Ultra-durable labels, resistant against water, smudge and abrasion are essential for many industrial applications. 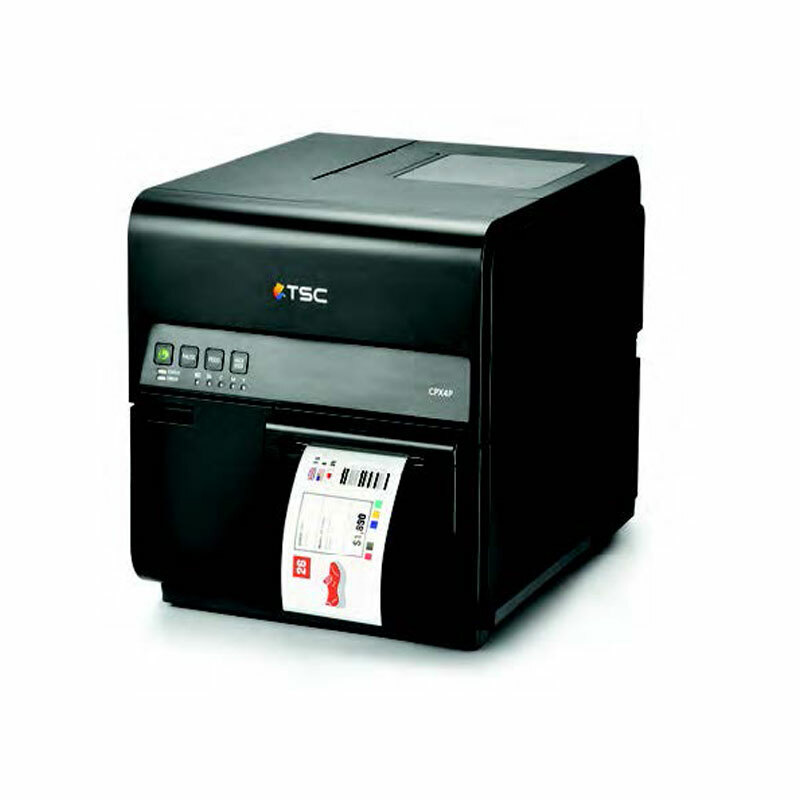 The TSC CPX4 series comprises of two printer versions, the CPX4P using pigmented-based ink and the CPX4D, using dye-based ink. Pigmented-based ink consists of powdery substances ensuring that printouts are particularly resistant for high durability. Dye-based ink, on the other hand, is water-based and characterized by a larger color selection and outstandingly vibrant colors. Select the printer, that exactly suits your business needs. For uncomplicated use, the CPX4 series’ printers by TSC are equipped with 8 LED indicators to see the current printer status at a glance and with 3 buttons ensuring simple operation. The compact digital printers run Windows operating systems and come with USB 2.0 Hi-speed and Ethernet interfaces. An auto cutter is available as an option. The color label printers of the CPX4 series by TSC present a cost-effective alternative to pre-printed media and provide fast, high-performance printing and brilliant colors for exceptional results.